It’s on the market for about $2.4 million. Take a look! Built in 1925 and sited on almost an acre of enchanting gardens, this Spanish Colonial style estate is the quintessential embodiment of European sensibilities. 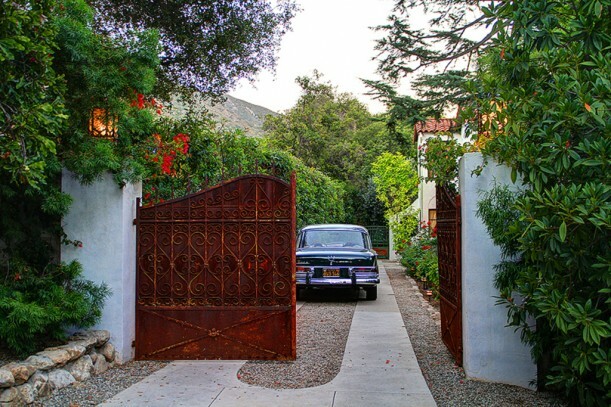 Walled and gated, the elegant property is the result of old world artisan craftsmanship. The home has soaring ceilings, arched windows and French doors, original fixtures that have been lovingly restored, and modern conveniences that have been incorporated seamlessly. The house has 3 bedrooms (including a master with balcony), 2 baths, and about 3,200 square feet. The home has numerous outdoor entertaining areas, including the terrace off the kitchen, complete with fire pit and fountain. 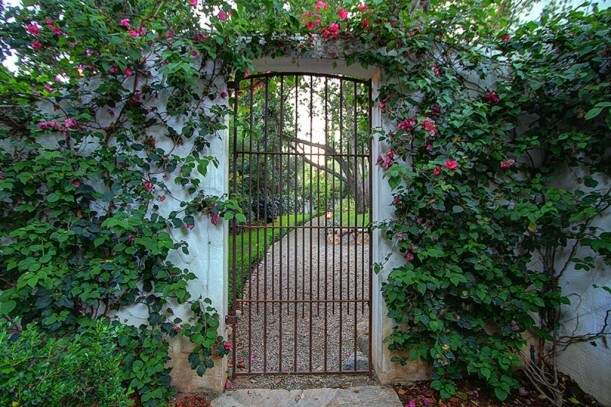 There are numerous water features throughout the property, as well as meandering paths, stone walls, antique european gates and unique garden designs. The salt water pool and spa with granite coping sits below the vast expanse of rolling lawn dotted with mature Oaks. Want it? Check the listing by Darrell Done of Coldwell Banker to see all of the gorgeous photos and get more information, including floorplans. All photos taken by Susanne Hayek Photography. Thanks to Bridget for telling me about it! Absolutely beautiful! The craftsmanship is so lovingly displayed. I recently viewed this home, it is absoutely stunning! It sits in one of the loveliest streets in Altadena too. Love the grounds and gardens. 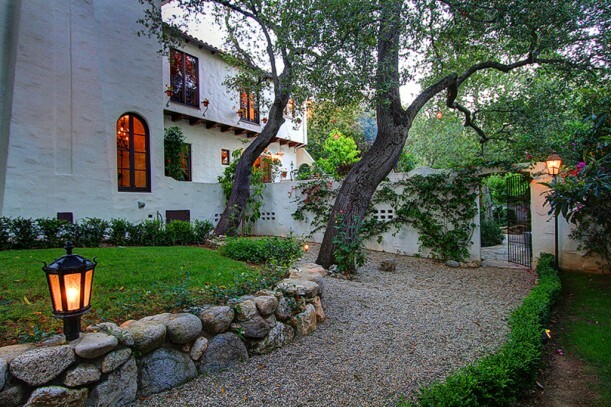 The exterior, while I wouldn’t choose a Spanish Colonial for myself, is exquisitely renovated. My deeply rooted Italian background would want to scrub all the interior walls – I am sure they are magnificent but they look dirty to me. What can I say?! I agree, they almost look smoke-damaged. What a gorgeous home. I bet it is already sold! This is not really my dream home (we have a similar taste for that, don’t we?_ the front porch, the charming interiors…), but I do like it. 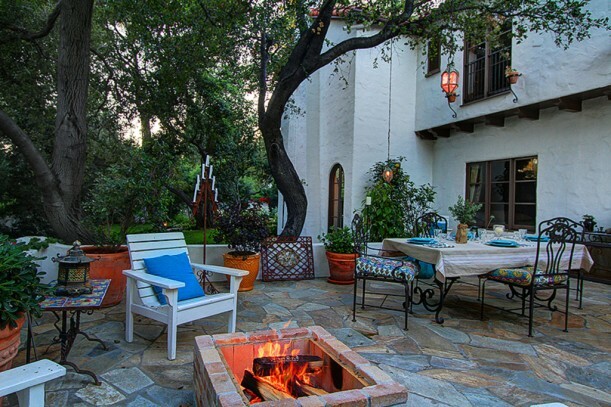 I especially like the outdoors.. that’s the most incredible part of this house. Wishing a blessed week, Julia! Wow! They did an amazing job inside and out! 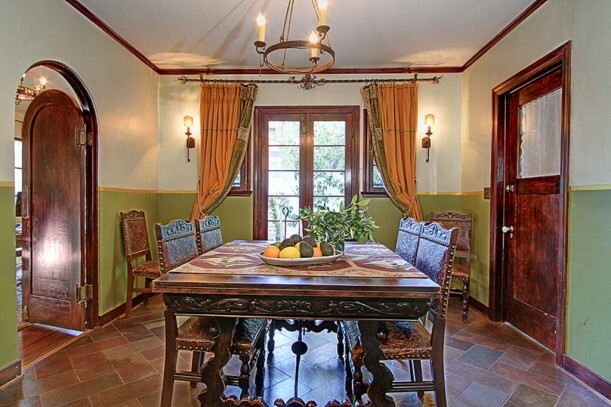 I really appreciate the way they stayed true to the home’s Spanish Colonial architecture throughout. 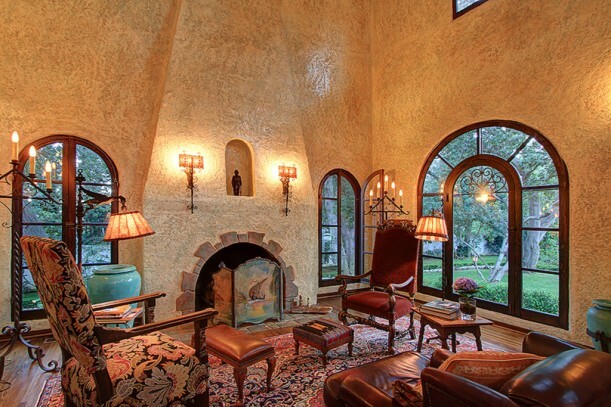 What a stunning home and the owners are wonderful caretakers of this 1925 gem! See, this messes with my split personality on homes. On one side I love the cottage look – lots of white wainscotting, white trim, pale blue or green walls, etc….then I see a Spanish or Italian style home and I go nuts for the arched doorways and wrought iron! I really love the outside of this house and grounds are beautiful. I have the same problem Which is the real me? Cottage or Spanish style? It seems so tranquil. Living there would feel like a constant vacation. Beautiful house! I especially like the kitchen (that stove!) and the exterior. Wow! Also, I want to thank them for NOT putting can lights in the ceilings. It really is a beautiful house. Really well done. And very, very overpriced. 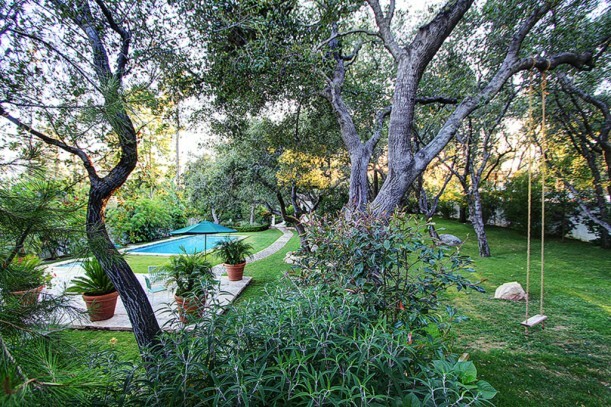 Altadena has the strangest housing market. I do hope it sells, but right now it’s still on the market. I love that they restored this home, and remained true to it’s character. I do not like the color of the walls in the library, but the warmth of the walls in the living room…. I had to look at those photos again and again. The slideshow on the listing was amazing.. I watched that a few times as well. The grounds are stunning, peaceful and serene. 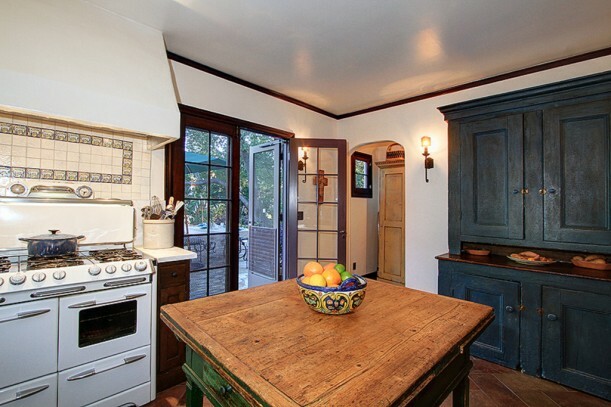 I love the old kitchen, and the fact that they did not try to do an open concept floorplan. I love that there are no upper cabinets! And the old hutch for storage…. love that. Who would not prefer to look out a huge window into the garden over a boring row of upper cabinets? It’s a wonderful house! The use of iron maden details as in the interior as outside give a romasneque feelling…Here, we still have this influence and apply it in many ways while used in design. Spanis Colonial are my current FAVE…and this is stunning inside and out! Just not a huge fan of the interior wall paint (kinda shiny) would want a matte white. But the exterior with all the walkways and gates are stupendous! The gardens & grounds are just heavenly! I wouldn’t even need the house, I’d just live on the patio. This is not my style at all. And yet, I would be insanely happy in this house for the rest of my days. My heart stopped at the first picture. The Secret Garden!! I know it bears no resemblance but that was my first reaction. Stunning. Absolutely stunning. But….I do not like the stainless appliances in the kitchen as they do not suit the space. 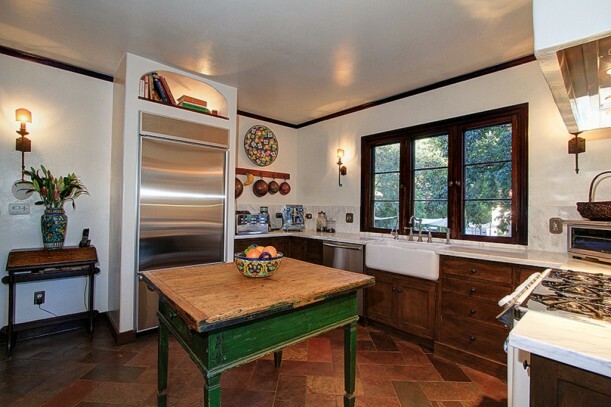 It is a rustic “old world” kitchen which deserves “hidden” appliances. that’s what i thought. The fridge was enormous and shiney! Another ditto on the stainless. But that’s my only complaint. 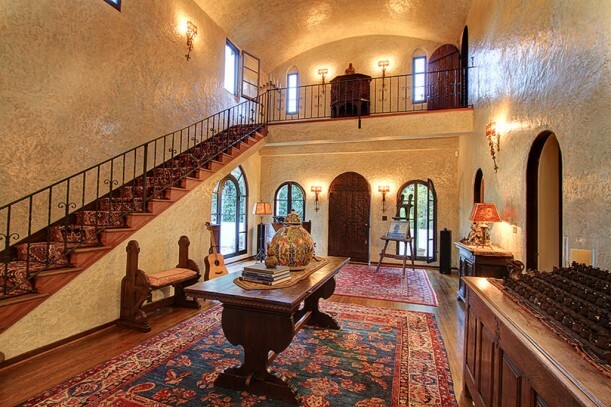 This house is amazing. I’d be so sad to sell it, if I were the owners. Between this house and your post about Homearama, I have one question: Are puddled curtains back in style? My dogs have another definition of ” puddled curtains”. They seem to think it’s a bathroom. 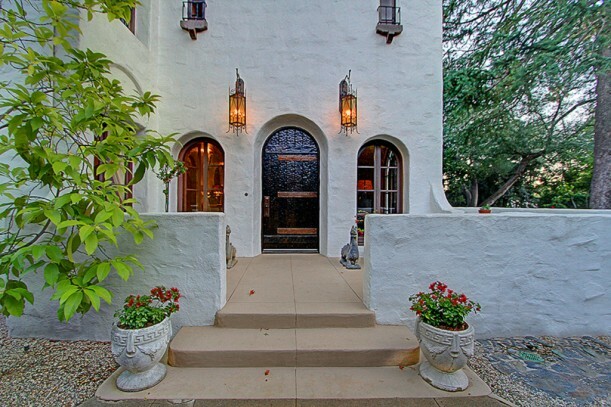 While not my personal style, this home and grounds are absolutely gorgeous, and I absolutely love the arched doors. My only compaint, and I hesitate to even mention it, is that I didn’t see any personal pictures or art. I like to see family pictures — to me, pictures like books, they make a home. My favorite picture is the last one, with the car and gate. Stunning, and classic, photography. The interiors are definitely not my style, but the exterior and gardens are to die for! Sorry, but that would be the scene where the Hollywood movie producer wakes up to find the head of his favorite horse in the bed with him. Really? Was that house like this one? I don’t remember…. 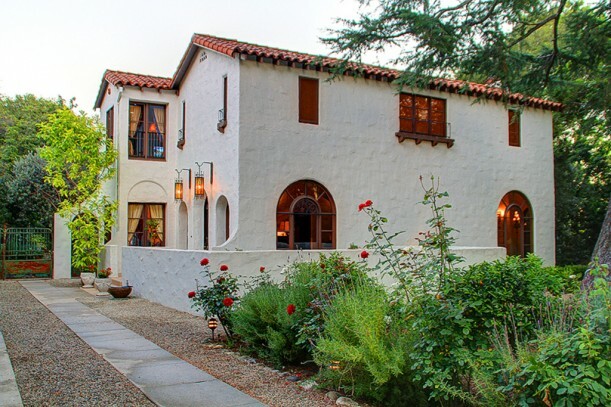 That house was more ornate, but yes, it was the Southern California Spanish Colonial style, and about the same era. 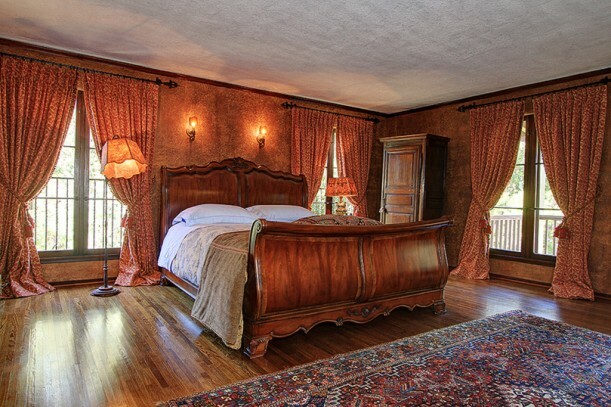 I didn’t think of The Godfather until you mentioned it, and then I thought, “Oh, man, she’s remembering the horse head house but she’s not remembering the horse head.” See, you remembered the beautiful house but not the horror in the bedroom. Perfect for Hooked on Houses. They did a fabulous job in restoring this lovely home to it’s former glory! Beautiful house. If money was no object I can’t figure out how I would decorate. 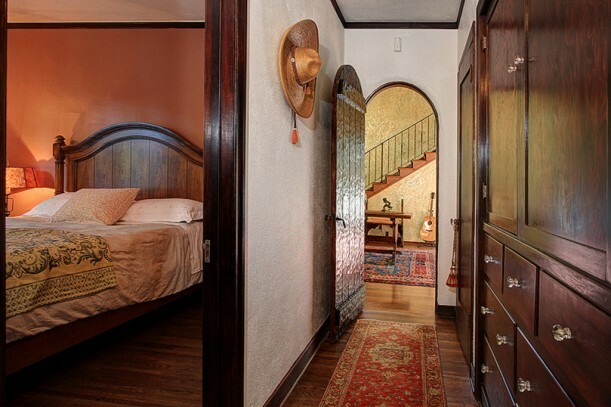 A Spanish style or a Beachy cottage style. Oh wait, I could have both because I would just buy more than one house. A really beautiful home & gardens but I had to check the floor plans….yes, there are only 2 bathrooms for over 3200 square feet. And one of the 3 bedrooms has no bathroom access. 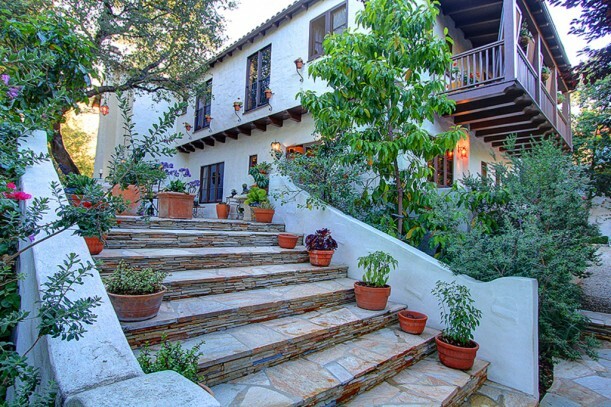 Gorgeous restored Spanish Colonial. The interior and exterior are very nice. I always wonder when I see a gorgeous property like this for sale……why oh why would you sell this place after working on it so diligently for 4 years? Maybe the fun is in the restoration and not living in it? I hope the owners aren’t in dire financial needs or aren’t going through a bitter divorce…….and that maybe they just found the next wonderful property to fix up! This house is absolutely GORGEOUS! I cannot help but wonder why the owners are selling it; especially after spending 4 years and lots of money restoring it. I would want to enjoy the fruits of my labor for a while. I would live in this house. I would change the decor though especially the walls. They are too dark for my personal taste. OMG how I would love to own a house like this. The period details inside makes the home special. 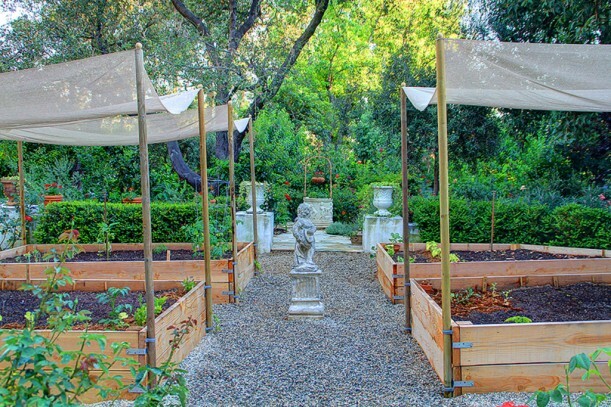 The outdoor gardens are breathtaking!!!!!!!!!!! Someone mentioned personal photos in her comment and I have to agree. I know that real estate agents tell home owners to put away family pictures so that people coming to see your home can imagine their own family photos in the house but that never made any sense to me. I think the opposite would be true. Family photos are what gives a home a warm touch and makes you think of your own family; not empty spaces where photos used to be. Some personal family photos and artwork would give this beautiful house an even more inviting look. 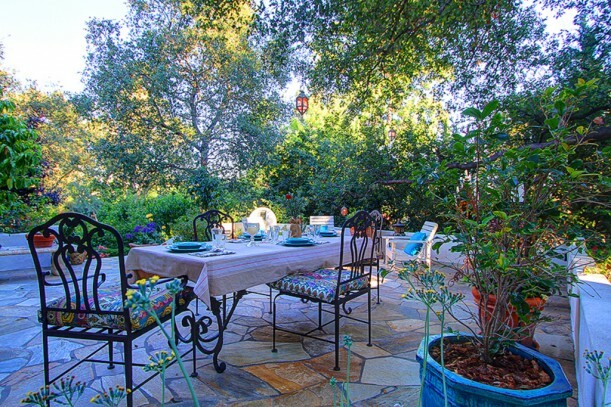 What a beautiful property, the garden is especially stunning. The terraces and patio areas are a real delight. In the interior, while not my personal style, I can appreciate the effort that went into getting the style right. 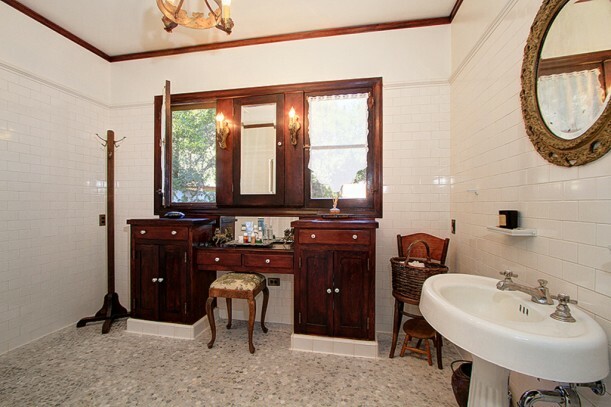 The listing slideshow was really well made and I was happy to see that they had used a professional photographer. I loved the dark dresser and the distressed table in the kitchen. Lovely! And so beautifully photographed. 🙂 The exterior is just amazing…love all those entertaining areas! This is a gorgeous home even though it is not my style. It was clearly lovingly restored and should be snapped up when the ideal buyer falls in love with it. What a treasure, a few books came to mind viewing these pictures! It has a romantic feel, love it! Lovely home and beautiful restoration. The inside seems a little cold to me, but it has amazing bones. The gardens are TO DIE FOR!!! I love the flowery garden with 500 lavender I cant image how good smell is. The owner of this house will be a very lucky person to own a charming lovely house.